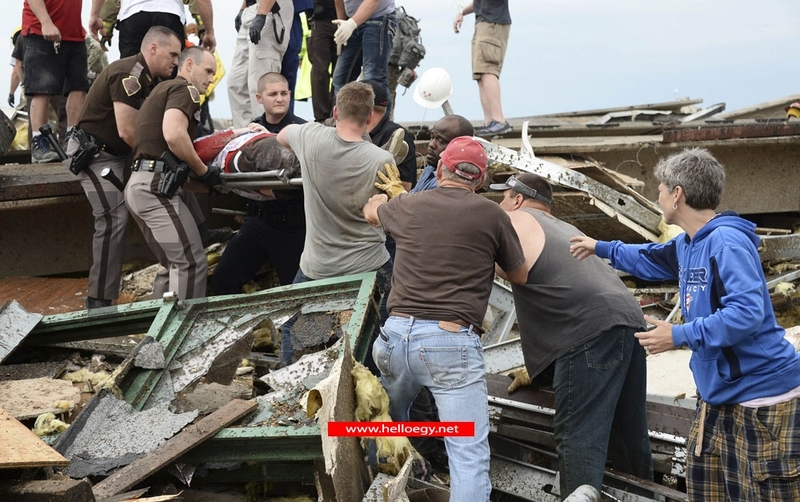 At least 91 people, including 20 children, were feared killed when a 2 mile wide tornado tore through an Oklahoma City suburb, trapping victims beneath the rubble as one elementary school took a direct hit and another was destroyed. 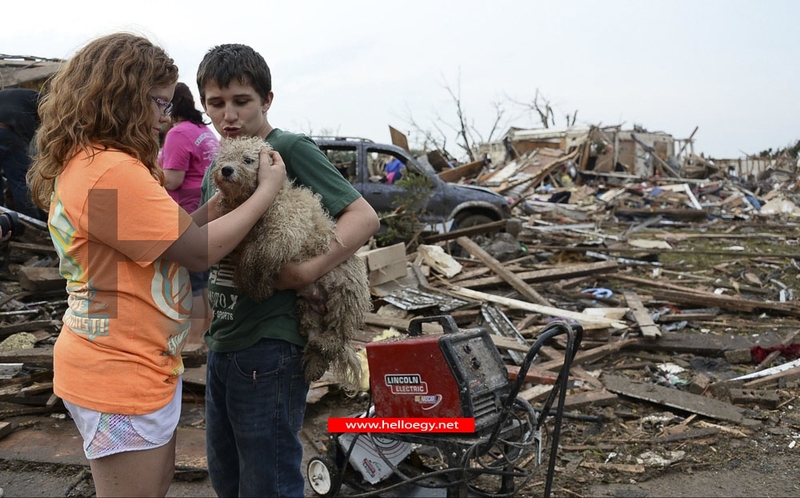 President Barack Obama declared a major disaster area in Oklahoma, ordering federal aid to supplement state and local efforts in Moore after the deadliest U.S. tornado since one killed 161 people in Joplin, Missouri, two years ago. Emergency crews were desperately searching the wreckage of Plaza Towers Elementary School that took a direct hit from the tornado on Monday afternoon, Oklahoma Lieutenant Governor Todd Lamb told CNN. There was an outpouring of grief on the school's Facebook page, with messages from around the country including one pleading simply: "Please find those little children." Another elementary school, homes and a hospital were among the buildings levelled, leaving residents of the town of about 50,000 people stunned at the devastation and loss of life. 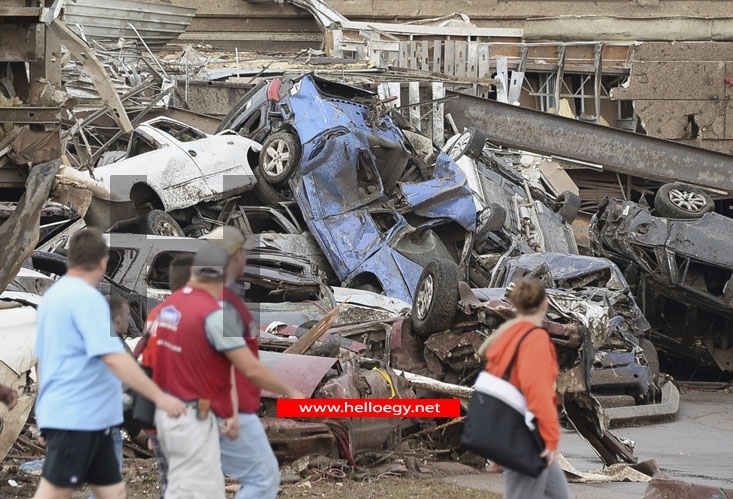 The Oklahoma medical examiner said 20 of the 91 expected to have been killed were children. The office had already confirmed 51 dead and had been told by emergency services to expect 40 more bodies found in the debris, but had not yet received them. At least 60 of the 240 people injured were children, area hospitals said. "We thought we died because we were inside the cellar door ... It ripped open the door and just glass and debris started slamming on us and we thought we were dead to be honest," Ricky Stover said while surveying the devastated remains of his home. Moore was devastated with debris everywhere, street signs gone, lights out, houses destroyed and vehicles tossed about as if they were toys. Rescuers were searching for survivors throughout the swath of devastation into the early hours of Tuesday, while the dangerous storm system threatened several southern Plains states with more twisters. Severe weather was expected through the night from the Great Lakes south to Texas. Speaking outside Norman Regional Hospital Ninia Lay, 48, said she huddled in a closet through two storm alerts and the tornado hit on the third. "I was hiding in the closet and I heard something like a train coming," she said under skies still flashing with lightning. The house was flattened and Lay was buried in the rubble for two hours until her husband Kevin, 50, and rescuers dug her out. "I thank God for my cell phone, I called me husband for help." Her daughter Catherine, seven, a first-grader at Plaza Towers Elementary School, took shelter with classmates and teachers in a bathroom when the tornado hit and destroyed the school. She escaped with scrapes and cuts. The National Weather Service assigned the twister a preliminary ranking of EF4 on the Enhanced Fujita Scale, meaning the second most powerful category of tornado with winds up to 200 mph (320 kph). Witnesses said Monday's tornado appeared more fierce than the giant twister that was among the dozens that tore up the area on May 3, 1999, killing more than 40 people and destroying thousands of homes. That tornado ranked as an EF5, meaning it had winds over 200 mph. The 1999 event in Oklahoma ranks as the third-costliest tornado in U.S. history, having caused more than $1 billion in damage at the time, or more than $1.3 billion in today's dollars. Only the devastating Joplin and Tuscaloosa tornadoes in 2011 were more costly. The National Weather Service Storm Prediction Center provided the town with a warning 16 minutes before the tornado touched down at 3:01 p.m. (2001 GMT), which is greater than the average eight to 10 minutes of warning, said Keli Pirtle, a spokeswoman for the center in Norman, Oklahoma. The notice was upgraded to emergency warning with "heightened language" at 2:56 p.m., or five minutes before the tornado touched down, Pirtle said. 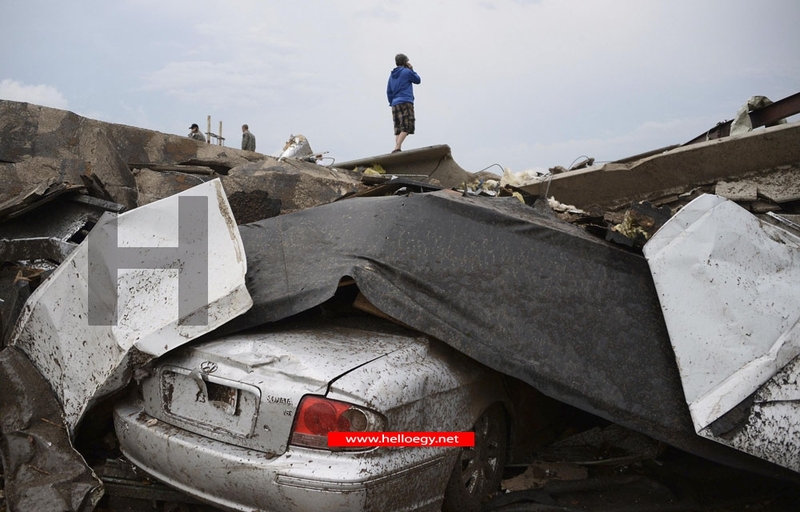 Television media measured the tornado at more than 2 miles (3 km) wide, with images showing entire neighborhoods flattened. The U.S. Federal Aviation Administration (FAA) imposed a temporary flight restriction that allowed only relief aircraft in the area, saying it was at the request of police who needed quiet to search for buried survivors. Oklahoma activated the National Guard, and the U.S. Federal Emergency Management Agency activated teams to support recovery operations and coordinate responses for multiple agencies. Briarwood Elementary School, which also stood in the storm's path, was all but destroyed. On the first floor, sections of walls had been peeled away, giving clear views into the building; while in other areas, cars hurled by the storm winds were lodged in the walls. Across the street, people picked through the remains of their homes. 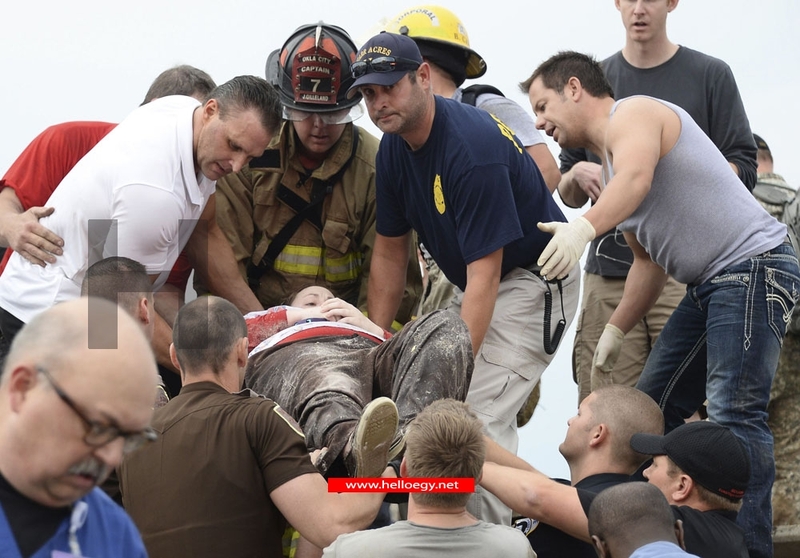 The number of injured as reported by several hospitals rose rapidly throughout the afternoon. Oklahoma University Medical Center alone was treating 65 patients, 45 of them children, though it was no longer expecting a further mass influx of casualties, spokesman Scott Coppenbarger said. Moore Medical Center itself sustained significant damage. "The whole city looks like a debris field," Glenn Lewis, the mayor of Moore, told NBC. "It looks like we have lost our hospital. I drove by there a while ago and it's pretty much destroyed," Lewis said. The massive twister struck at the height of tornado season, and more were forecast. On Sunday, tornadoes killed two people and injured 39 in Oklahoma.